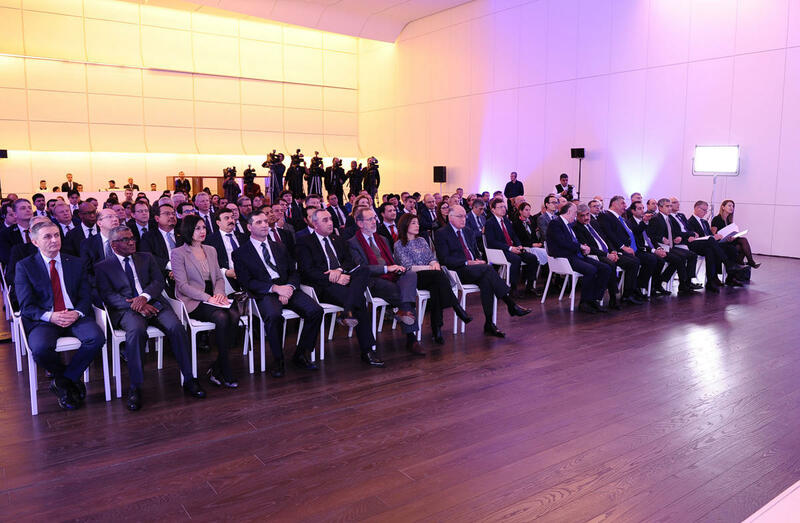 A presentation was held at the Heydar Aliyev Center on Dec.14 for representatives of the diplomatic corps accredited in Azerbaijan over Baku's bid to host World Expo 2025. 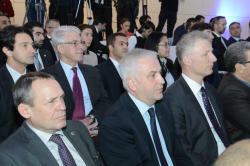 Executive Director of the Heydar Aliyev Foundation Anar Alakbarov, assistant to the first vice-president of Azerbaijan, Head of the Azerbaijani delegation to the Bureau International des Expositions (BIE ) Elchin Amirbayov and Executive Director for Expo 2025 Baku Operations Secretariat Paul Foster addressed the presentation ceremony. At the event, the participants were informed about the work carried out regarding Baku's bid to host World Expo 2025 and steps to be taken. It was noted that the letter of Azerbaijan's President Ilham Aliyev about the nomination of Baku for holding the World Expo 2025 was transferred to the BIE on May 18. 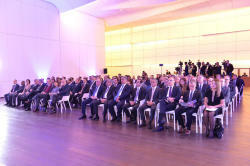 Speaking about the reception organized with the participation of the First Vice-President of Azerbaijan, Mehriban Aliyeva, in Paris on Nov.14 on the occasion of Baku's bid to host World Expo 2025, Alakbarov said that the Azerbaijani government is providing high political support to the project. 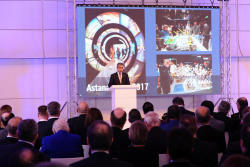 He noted that Azerbaijan pursues the chance to bring the World Expo to Baku and to this part of the world for the first time. Talking about the success and experience of Azerbaijan in holding international events, Alakbarov highlighted that Baku hosted the World Summit of Religious Leaders in 2010, the Global Forum of the UN Alliance of Civilizations in 2016, the biannual Baku International Humanitarian Forum, the World Forum of Intercultural Dialogue supported by UNESCO, the Council of Europe, the UN Alliance of Civilizations, the World Tourism Organization, ISESCO - created unique opportunities for active cooperation between member states of the Council of Europe and the Organization of Islamic Cooperation and other event. 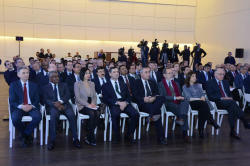 He stressed that Azerbaijan has become a reliable partner of the world countries, both economically and politically. 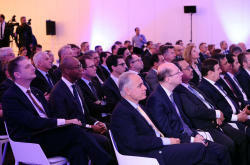 Alakbarov reminded that Azerbaijan is a full member of the BIE, and since 2000 participates in the Expo. He stressed that in Milan the national project entitled “Azerbaijan: A treasury of biodiversity” received a high appraisal among 54 pavilions by the Organizing Committee of Milan Expo and was named the pearl of the Milan Expo. National Pavilion won the prize for the most successful project in the “Design and materials” nomination and was acknowledged as the most beautiful pavilion of the Milan Expo 2015, he added. He further stressed that Azerbaijan has also attended the Specialized Expo in Antalya in 2016 and won the prize in the one of the most outstanding nominations. Also, while participating at "Astana Expo" in Kazakhstan, Azerbaijan presented the national pavilion "Land of Energy" and was awarded with a second prize in the “best design” category. Alakbarov expressed gratitude to President Ilham Aliyev for the support rendered by the state to the participation of Azerbaijan at a high level in the world exhibitions organized in Milan, Antalya and Astana. It was noted that preparations are underway for the creation of the Azerbaijani pavilion at the World Exhibition "Echo 2020 Dubai". Stressing that Azerbaijan is a politically stable and steadily developing country, Alakbarov noted that it will host the European Youth Olympic Festival in 2019, and the European Karate Championship and European Football Championship group stage matches in 2020. He reminded that Azerbaijan is successfully hosting car races, saying the Formula 1 Azerbaijan Grand Prix, first staged in 2016, will continue to be held annually. 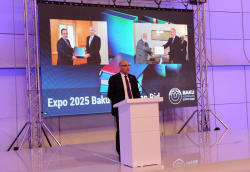 Alakbarov said the Baku Expo 2025 is widely supported by the public, along with the state. He said as President Ilham Aliyev outlined in the city candidacy file, for centuries Azerbaijan has been at the crossroads of cultures and civilizations with its unique geostrategic location, a political, commercial and cultural bridge between east and west, north and south. Speaking about the tourism potential of Azerbaijan, which has turned into a center for intercultural dialogue, Alakbarov noted that the country has a favorable tourism infrastructure, including more than 500 hotels. He stressed that the rich and ancient culture and unique architecture of Azerbaijan make the country attractive for tourists. Addressing the event, Amirbayov informed about the work done so far in the framework of the Baku Expo 2025 and the steps to be taken before the elections to be held on Nov.18, 2018 to define the city that will host the World Expo 2025. He noted that in late September 2017 Baku's candidacy file for the World Expo 2025 was submitted to the BIE, and during the next 11 months the Bureau will get acquainted with Azerbaijan's proposal for the exhibition and the prepared project document on the organization of the Expo 2025. 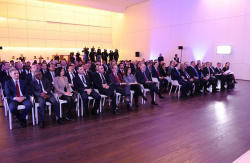 Amirbayov appreciated the participation and speech of the First Vice-President of Azerbaijan, Mehriban Aliyeva, at a reception organized in Paris on Nov.r 14 in honor of the nomination of Baku as a candidate city for the Expo 2025 as a proof of the great importance that the state attaches to the holding of this international event. Speaking about the urgency of the topic 'Developing human capital, building a better future’ proposed by Azerbaijan for the Expo 2025, he stressed that the topic is important for Azerbaijan and corresponds to the agenda of international development, in particular, to the UN Sustainable Development Goals. Amirbayov informed the participants that so far the BIE has not held a World Exhibition in Eastern Europe, the Caucasus region and the Caspian Basin. He said that the organization of the Expo 2025 in Baku can expand the traditional geography, where this international event is held. The head of the Azerbaijani delegation stressed that, along with the growth of local business opportunities in Azerbaijan, the exhibition will play an exceptional role in increasing investments and establishing business ties. Amirbayov believes the World Expo 2025 will positively affect the growth of the number of visitors to Azerbaijan, to which tourists have shown great interest in recent years. Foster, for his part, informed about the main technical parameters of the project, as well as about the preparatory work for the visit of the evaluation commission of the BIE to Baku in March 2018. 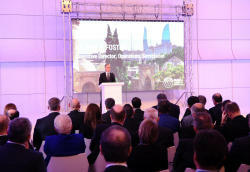 Foster said that the territory intended for the exhibition "Baku Expo 2025" is located in the eastern part of Baku. This place has a territory of 200 hectares, he said, adding that the territory will have the form of an eight-pointed star, which is displayed on the State Emblem of Azerbaijan. Foster said the struggle of Azerbaijan, which has ancient history, culture and inherent hospitality, for holding the World Expo for the first time shows the country's confidence in its forces, its capabilities, development in the political and economic spheres. Baku is not only an interesting place for every tourist who comes to Azerbaijan, both in terms of history and attractions, but it is also the most reliable city where they feel safe. He said that www.bakuexpo2025.com is functioning since November 14. The site reflects the main points of the exhibition. The event also featured videos about the culture, history, customs and traditions of Azerbaijan, religious tolerance, as well as prestigious events held in the country, and on the theme of Expo proposed by Azerbaijan.